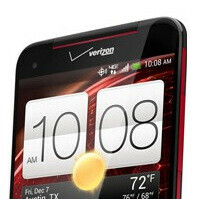 Does the HTC Droid DNA get you excited enough to make you reach for your wallet? Then here is a deal you might want to check out, in case you haven't already reserved a unit through Verizon's pre-order page. Online retailer Wirefly is now offering the Droid DNA at $50 off, thus bringing its price down to a very tempting $150. Your signature under a 2-year service agreement with Verizon is required, naturally. In case you aren't yet familiar with the Droid DNA by HTC, the smartphone has quite a lot to offer when it comes to specs. Its most notable feature is the 5-inch display with the impressively high resolution of 1920 by 1080 pixels, resulting in a pixel density of 440ppi. Then comes the quad-core processor powering the handset - a 1.5GHz Snapdragon S4 Pro chip by Qualcomm. In addition, you get an 8-megapixel camera, a wide-angle front-facing snapper, 16GB of storage and LTE connectivity. You can pre-order an HTC Droid DNA from Wirefly by following the source link below. The smartphone is scheduled to ship on November 20. Samsung Fans were saying Apple fans as isheep but seriously Samsung sheep are much much worse than Apple Fans !! I'm sorry where are you getting Samsung fans from? Agreed. What's the point of a big HD display perfect for video if you only have 16gb? Even Nokia put 32gb on the 920 since it has no SD card slot. Its perfect for the money end of story. I think I'd rather pay the $199 and get it from Verizon. If you get it from Wirefly, just make sure you read all the fine print first. Is it unusual for Wirefly to have the phone so quickly and on discount? Eh Wirefly is okay but I would say wait for Amazon Wireless to drop the price, it's safer. Is there any sign about releasing international version of DROID DNA ? Since its CDMA also can this be used on Sprint's network?